It was fifty years ago today- President Lyndon Johnson announced that Associate Justice of the Supreme Court- Abe Fortas- an long time fixer for LBJ back in Texas- would be nominated to replace retiring Chief Justice Earl Warren on the U.S. Supreme Court. He also announced that another Texan- appellate judge Homer Thornberry would be the nominee to replace Fortas as Associate Judge. 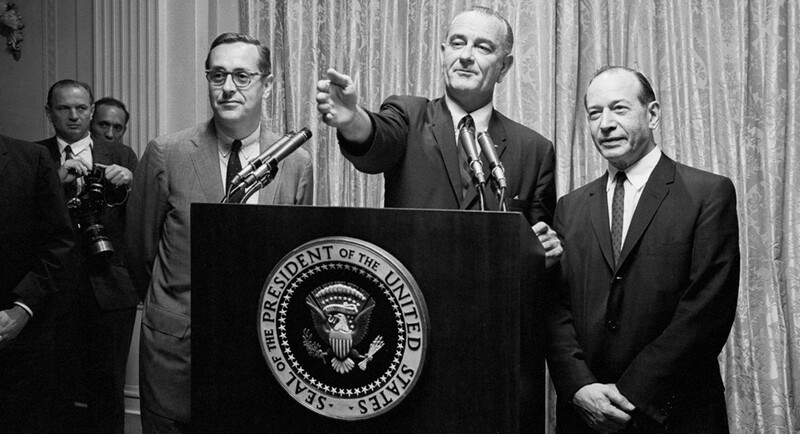 There was immediate opposition to this plan- Fortas who after being named Associate Justice in 1965 by LBJ-remained close with the president- ran into ethics problems and his nomination would be withdrawn on October 3rd. With that Thornberry’s nomination was moot. Later Fortas would resign from the U.S. Supreme Court. It being LBJ’s final months in office it was too late for him in October to make another nomination. Richard Milhous Nixon would win the presidential election in November and he would be the one to name Warren’s replacement- and he kept the Warren name active by naming Warren Burger to replace Earl Warren.